LONDON: Quantzig, a leading analytics services provider, has announced the release of their new storyboard on the importance of data and analytics for businesses. Each of these downloadable articles explains how data and analytics solutions can help companies to make smart decisions, improve customer satisfaction, decrease e operational expenditure, reduce risks, and enhance fraud management. Business leaders across industries are increasingly adopting big data analytics and data visualization techniques to improve their business operations. However, many organizations still seem to think of analytics as a quick fix for their business needs and investing in data and analytics is just the beginning of their journey. But to achieve business goals, it is high time for businesses to leverage data and analytics solutions that can help them boost transparency and enhance their approach towards data-driven decision making. Quantzig’s data and analytics solutions have helped companies with the right data visualization techniques, capabilities, and frameworks to handle the volume, variety, and velocity of data to make informed business decisions while ensuring information privacy and security. 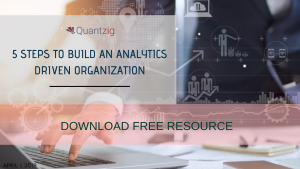 Below, we have summarized some of Quantzig’s free resources and have also highlighted ways in which data and analytics solutions have helped businesses to gain a leading edge in today’s competitive business scenario. Our data and analytics solutions help companies to make proactive business decisions and pre-emptive planning. Request a free proposal to gain better insights. #1: How can analytics solutions transform business models? A successful business model is not just about completing a business plan or determining which product or service to pursue. It is about mapping out the strategy to create ongoing value for customers. But you must be wondering where to start. This free resource by Quantzig can be your key to success. It gives a detailed overview of how companies can reshape their business models by leveraging data and analytics solutions. Also, it unveils five secrets that can help companies identify and capitalize on new business opportunities. Gain a holistic view of your datasets with our customized data and analytics solutions. Request a FREE demo now! 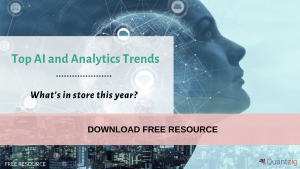 #2: What are the top AI and analytics trends in 2019? Analyzing and optimizing the customer experience is the bedrock of successful digital transformation in 2019. Data and analytics capabilities with minimal manual efforts have become the hallmark of all business intelligence solutions. Artificial intelligence (AI) and machine learning technologies are transforming businesses and organizations have become highly dependent on automated data-analysis capabilities. This free resource by Quantzig uncovers some of the top AI and analytics trends that took off within corporate boardrooms but will continue to proliferate across different layers of business operations in 2019 and beyond. To know more about our portfolio of services, get in touch with our experts right away. #3: What are the key steps to build an analytics-driven organization? Companies across industries agree that the capacity for data and analytics is becoming very crucial to their basic viability. Therefore, they need to be prepared for the future when data and analytics are going to be both important and integrated at all levels of organizational decision-making. It has become imperative for businesses to exploit available data in order to maximize profits. However, when it comes to extracting business value from data, most of the companies fail miserably. Quantzig’s free resource uncovers a few important steps that can help organizations to improve transparency, enhance business efficiency, and boost overall business performance. Download the free resource now to know more.